When we flush, where does it go? What about what we pour down the sink? Maybe you know that the waste travels to a waste water treatment facility, but what actually occurs there? What would happen if we didn't have access to clean water? Fortunately in the United States we nearly always have access to clean water due to water treatment facilities. However this is not the case in many countries as treatment facilities do not exist or, even worse, some locations are actually running out of water. 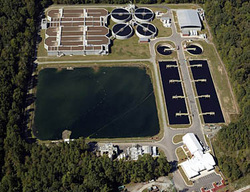 In this unit we will examine the process of treating waste water, potential lack of clean water access, visit a local waste water treatment plant, and examine our own water treatment protocols to help answer these questions. What happens when we run out of clean water? Construct and revise an explanation based on evidence for the cycling of matter and flow of energy in aerobic and anaerobic conditions (LS2-3).